In order to create CAR T cells capable of a long-term memory response without chronic depletion of B cells, Viaud et al. developed a switchable CAR (sCAR) T cell platform in which the sCAR T cells could be reversibly turned “on” or “off” with a dosage of an antibody-based switch. In the absence of continuous antigen stimulation, this setup would allow the sCAR T cells to “rest”, which is necessary for robust memory formation, and give B cells the opportunity to replete. The researchers tracked the fate of the sCAR T cells and their impact on the B cell population over time; these results were recently published in PNAS. Previously, the team had developed an sCAR T cell system consisting of a CD19 switch – an antigen-binding fragment of a murine CD19-targeting antibody (Fab) engrafted with a peptide neoepitope (PNE) – and a corresponding sCAR with a single-chain antibody variable fragment (scFv) that recognized the PNE. The CD19 switch coupled the CD19 on the target cell to the PNE-targeted sCAR. The rapid clearance of the CD19 switch Fab (lacking an Fc region) allowed control of timing of sCAR stimulation. Optimization efforts identified an IgG4m hinge and a wild-type CD3ζ intracellular domain as critical for persistence and expansion of the sCAR T cells. Viaud et al. then generated sCAR T cell constructs with CD28 (Ig-28z), 4-1BB (Ig-BBz), or CD28 and 4-1BB (Ig-28BBz) costimulatory domains and tested them in vivo. The researchers utilized a syngeneic tumor model in which murine 38c13 CD19-expressing B cell lymphoma cells were subcutaneously injected into the flank of C3H mice, which have a competent immune system. After tumors were established, mice were preconditioned with cyclophosphamide and then inoculated with sCAR T cells followed by the CD19 switch. The CD19 switch was dosed every other day for two weeks, followed by 2 weeks of rest when no CD19 switch was administered. This dosing schedule was repeated for three cycles. Ig-BBz and Ig-28BBz constructs durably eliminated tumors in all mice without relapse, while Ig-28z constructs and the standard anti-CD19 CAR T cells (with a CD28 costimulatory domain) failed to control tumor growth. All treatment groups led to the depletion and eventual rebound of B cells. The Ig-BBz and Ig-28BBz sCAR T cells iteratively depleted B cells over the three switch dosing cycles, and B cells rebounded during rest phases, demonstrating the functional reversibility of activity of these sCAR T cells. Viaud et al. then took a closer look at how timing of the switch dosing regimen affects sCAR T cell phenotype and B cell depletion. To do this, they created three different regimens: 2 week dosing, 2 weeks rest (reference); 3 weeks dosing, 1 week rest (to mimic chronic antigen stimulation); 1 week dosing, 3 weeks rest (to mimic acute stimulation). For each regimen, low and high doses of the switch were tested. The regimens were tested in C3H mice without tumors, and the Ig-28BBz sCAR T cell construct was selected because of its efficacy in the tumor model and close resemblance to a human clinical candidate that is currently in development. B cells were depleted in all dosing regimens after the first and second cycle. However, in the second cycle, the 1 week dosing regimen resulted in a dramatic expansion of sCAR T cells (the level of expansion correlated with the dosage of the switch), whereas no expansion was observed in the 3 week dosing group. This result demonstrated that the rest phase was more important to sCAR T cell expansion than the switch dose level. Phenotypically, the sCAR T cells expanded during the second cycle were mostly CD8+ effector/effector memory T cells (TE/EM). The CD8+ TE/EM cell population later contracted, while the central memory (TCM) phenotype was retained – at persistently higher levels in the 1 week dosing group than in the other regimens. Tracking the trafficking of the sCAR T cells, the team found that in tumor-bearing mice, sCAR T cells depleted B cells in the peripheral blood, spleen, tumor-draining lymph node (TDLN), and bone marrow. Phenotypically, sCAR T cells were mostly CD8+ TE/EM in the blood, spleen, and bone marrow, and importantly, mostly CD8+ TCM in the TDLN. During the contraction phase, the number of sCAR+CD8+ TCM cells remained relatively constant in the tissue, whereas a dramatic decrease was observed in the blood. The phenotypic fate of CAR T cells determines their therapeutic efficacy in the clinic, and the TCM phenotype has been shown to effect sustained remissions in patients with acute lymphoblastic leukemia. In this study, Viaud et al. demonstrated that the switchable CAR T cell platform led to a durable antitumor response due to the development of a persistent sCAR+ CD8+ TCM population in the secondary lymphoid tissues. The period of rest, during which the sCAR T cells were inactive, was crucial for the development of the sCAR+ CD8+ TCM subset as well as for the repletion of B cells, which could ultimately create a favorable efficacy and safety profile in the sCAR T cell product in the clinic. Viaud S., Ma J.S.Y., Hardy I.R., Hampton E.N., Benish B., Sherwood L., Nunez V., Ackerman C.J., Khialeeva E., Weglarz M., Lee S.C., Woods A.K., Young T.S. Switchable control over in vivo CAR T expansion, B cell depletion, and induction of memory. Proc Natl Acad Sci U S A. 2018 Nov 13. Comparing intracellular delivery methods of electroporation versus cell squeezing (a microfluidic membrane deformation technique), DiTommaso et al. found that while the methods were similar in their ability to produce viable, edited T cells, electroporation disrupted gene expression profiles, affected a variety of cellular pathways, drove PD-1 upregulation, and induced non-specific cytokine bursts that ultimately dampened the long-term effector functions of the T cells and limited their antitumor efficacy in vivo. Squeezed T cells maintained a phenotypic profile similar to controls, and showed antitumor efficacy in mice. Using Trp1 peptide variants with differential MHC binding and two monoclonal T cell populations, Clancy-Thompson et al. show that nuances of peptide:MHC stimulation can dramatically alter the phenotype of newly primed effector cells. Effector cells generated with low affinity peptide proliferated as well as cells stimulated with high affinity peptide, but demonstrated lower cytokine production. However, cytotoxicity (granzyme B and direct tumor cell killing) and in vivo trafficking were higher and PD-1 expression was lower. Interestingly, control of tumor growth in vivo was equivalent, underscoring the subtleties of T cell priming. To identify the mechanism of action of co-inhibitory LAG-3 on CD4+ T cells, Maruhashi et al. performed cell binding assays with the extracellular domain while varying covalent peptide:MHC (pMHC) expression and screening for functional effectors. Stability of the pMHC complex was the primary determinant of LAG-3 binding to APCs and T cell inhibition was mediated by signaling of the LAG-3 intracellular domain. Secondarily, stable but highly expressed non-cognate pMHC also partially inhibited T cell activation. In diabetic NOD mice, LAG-3 slowed disease progression by suppressing autoreactive, high-affinity, peptide-specific T cells. Targeting an immunologically “cold” tumor, Kinkead et al. used a long peptide neoantigen vaccine with STING agonist in a mouse model of pancreatic adenocarcinoma. 16% of predicted neoantigens (including some with deliberate anchor residue changes) generated a CD8+ T cell response in healthy mice. A subset of 12 peptides combined with STING agonist were used in vivo with moderate antitumor effect alone but significant synergistic efficacy with anti-PD-1 or agonist OX40 antibody singly and in combination. Antigen-specific T cells increased in the tumor and agonist OX40 antibody uniquely enhanced T cell quality and immunological memory. In the context of anti-PD-1 or adoptive T cell therapy in mouse models of glioblastoma and medulloblastoma, Flores et al. found that concomitant i.v. delivery of bone marrow-derived, lineage-negative, CCR2+ hematopoietic stem and progenitor cells (HSCs) enhances T cell infiltration and activation, downregulates immunosuppressive pathways, and overcomes resistance to immunotherapy, enhancing survival. 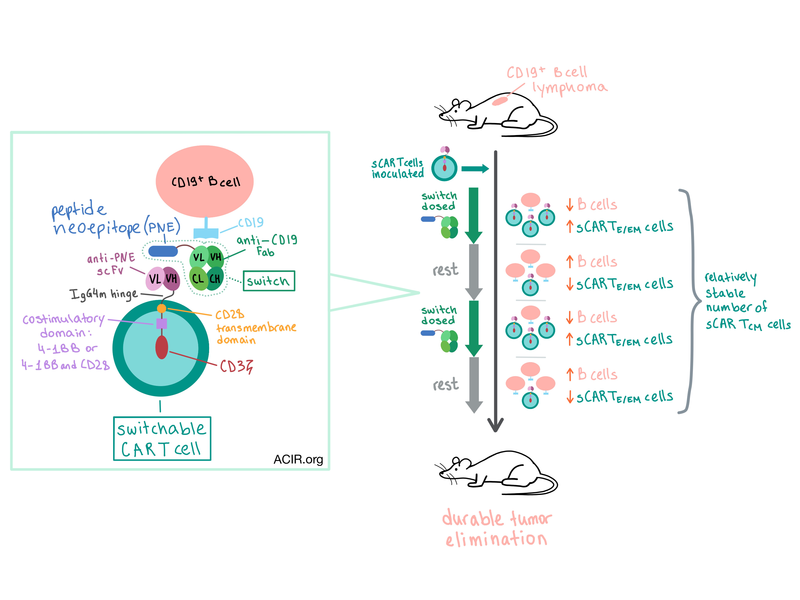 CCR2+ HSCs migrate into tumors and differentiate into CD11c+ APCs. In secondary lymphoid organs, HSC-derived APCs cross-present tumor antigens on MHC-I to endogenous and adoptively transferred CD8+ T cells. Gubin et al. utilized single cell RNAseq and CyTOF to analyze the lymphoid and myeloid compartments in mice with T3 murine sarcoma that were treated with control, leading to tumor progression, or immune checkpoint therapy (ICT: anti-PD-1, anti-CTLA-4, or both), leading to tumor rejection. ICT reduced Tregs and activated and expanded NK cells, CD4+ T cells, and CD8+ T cells. This resulted in increased IFNγ, which led to maturation of monocytes into proinflammatory CX3CR1-CD206-iNOS+ macrophages in tumors that were ultimately rejected. Mice with fibrosarcoma or colorectal carcinoma were treated with a peptide vaccine (AH1, a murine retrovirus-derived peptide) alone or in combination with F8-TNF (murine TNF fused to an scFv of the F8 antibody, targeting fibronectin in the tumor extracellular matrix). AH1 alone modestly slowed down tumor growth, while the combination treatment led to a complete response in some mice by inducing tumor necrosis and increasing the density of AH1-specific CD8+ T cells in the TDLN and the tumor. AH1-specific CD8+ T cells had a predominantly effector phenotype and expressed markers of exhaustion (PD-1, LAG-3, TIM-3). Slaga, Ellerman, and Lombana et al. used HER2 as a target to explore how bivalent avidity effects can improve the therapeutic index of T cell-redirecting bispecific (TDB) antibodies. When used in an anti-HER2 TDB construct, Fabs with reduced monovalent HER2 affinity showed 1000x improved selectivity for high vs low HER2-expressing tumor cell lines in binding and cytotoxicity assays, low cytotoxicity to low HER2-expressing tumor or normal cells, and effective tumor control in human PBMC reconstituted mouse xenografts. No untoward pharmacological effects were observed in cynomolgus monkeys, supporting clinical translation.